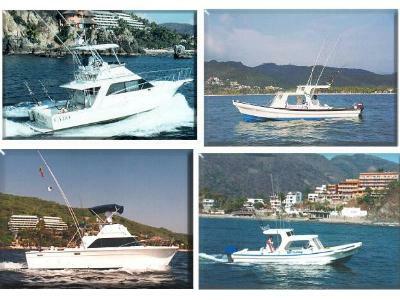 Sportfishing in Ixtapa Zijuatanejo Mexico on super panga sport cruiser and luxury yachts. U.S. based owners, promoters, and avid anglers Stan Lushinsky and Susan Richards have been developing the sportfishing resources of this newly discovered angling paradise since 1989. The waters of Ixtapa and Zihuatanejo are particularly appealing and exciting to fish since there is a traditional rich history of tremendous sportfish stocks as well as a lack of angling pressure. Offshore species such as Pacific Sailfish, Blue & Black Marlin, Yellowfin Tuna, Dorado, and Wahoo as well as an assortment of inshore species including Roosterfish, Snapper, Grouper, Spanish Mackerel, and Yellowtail Jacks are available throughout the year. All boats are well-maintained and equipped with safety features as well as VHF radios and some GPS systems. Further enhancing the value of this operation is the inclusion of quality PENN INTERNATIONAL tackle, which includes light tackle, spinning & conventional reels from 12T's to 80TW's on all boats. All packages include an 8-hour charter day, tackle, dead bait & lures, all dispatch fees & taxes, ice, and participation in the Billfish Foundation's Tag & Release Program. 35' and 46' luxury yachts powered by powerful twin-engine power plants. Various live well and navigational systems as well as safety equipment on board. Galleys, heads, a/c, luxury furnishings and sleeping quarters. 28' to 42' custom cruisers, single & twin engines available. Various live well and navigational systems as well as safety equipment on board. 25' open fishing boats powered by 48 - 75 horsepower engines. Various live well and navigational systems available as well as safety equipment on board. For the anglers with special interests, Ixtapa Sportfishing Charters also offers light tackle (bait & switch) and flyfishing opportunities. Ixtapa Sportfishing Charters encourages anglers to enrich their sportfishing adventure by taking advantage of all our features, including use of the new Z-Wing Downrigger. Puerto Mio Hotel Marina Resort in Zihuatanejo. For a little more privacy we can highly recommend the very comfortable Adelamar Bungalows near Madera Beach.